Free shipping. Buy direct from HP. 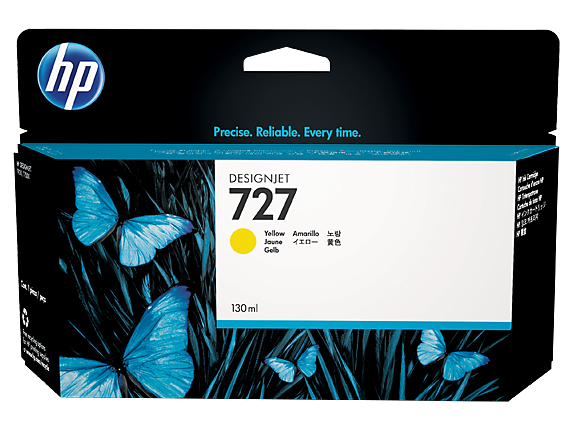 See customer reviews and comparisons for the HP 727 130-ml Yellow DesignJet Ink Cartridge. Upgrades and savings on select products. Present your professional best with the accurate, professional prints produced by Original HP inks.Get dark blacks, true neutral grays,  vivid colors with six Original HP inks and the HP printhead.Avoid waste and rework—Original HP printing materials and inks work together to get the job done right. High-capacity 300-ml ink cartridges enable more unattended printing. You can also choose more affordable 130-ml ink cartridges.Take advantage of free, convenient return and recycling. Visit http://www.hp.com/recycle for details.No need to check—Original HP supplies and the printer interact to alert you when supplies need to be replaced. 1 Comparing 300-ml HP 727 DesignJet Ink Cartridges to 130-ml HP 727 DesignJet Ink Cartridges. 2 Visit http://www.hp.com/recycle to see how to participate and for HP Planet Partners program availability; program may not be available in your area. Where this program is not available, consult the Material Safety Data Sheet (MSDS) available at http://www.hp.com/go/ecodata to determine appropriate disposal. 3 True neutral grays produced by printers compatible with the HP Three-black ink set.